Do you know what the top 5 attributes of your offerings are that your customers find most important? Do you have real-time monitoring capability of those attributes for some or all of your customers? If you invest in improving aspects of customer service, can you measure the results in real time, with actual customer feedback? 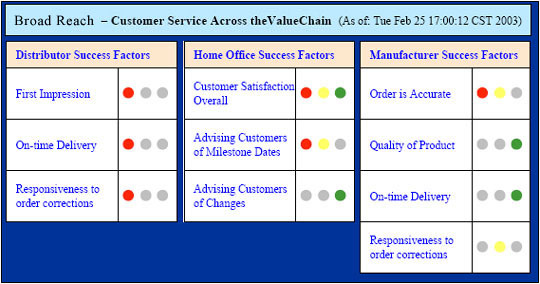 Do you have real time visibility into customer service drivers across the value chain from manufacturers to distributors, vendors, and end customers? Broad Reach Customer Service Score Card is an easy to use online tool that can monitor customer service for one customer relationship or a thousand. You can monitor individually or as a group of customers, or both. Broad Reach allows you to measure the hard to measure aspects of customer service, like ‘quality of communication’and ‘perception’oriented measures.Defining, measuring and monitoring the top attributes of customer service gives your organization the power to influence the 3 R’s of Retention, Repurchasing, and Referrals. You can gain visibility into the direct causes that directly affect your investment in customer service staff, training, or tools will have on the 3 R’s in real-time. To truly provide the most effective customer service, you must have visibility into customer service drivers and levels across the value chain. Broad Reach gives you quick and easy visibility into the success factors that drive customer satisfaction and operational excellence, by the orchestration of strategic goals executed across the value chain. From the manufacturer, through the distributors and vendors to the ultimate customer, Broad Reach can give you the ability to monitor, respond, and verify the effectiveness of the complete value chain. Broad Reach Early Warning System automatically identifies and notifies managers of customer problems or successes, in real-time. Monitor customer service success factors. The combination of Broad Reach’s measuring capability with its automatic, rules based monitoring creates a powerful early warning system that can flag bad or good occurrences that require follow up. Broad Reach allows the quick and easy setting up of performance measures. You can define any performance measure you would like to track, and the system is so fast and easy, that you can adjust and refine the measures around until you get them just right. Data is gathered by the Performance Improvement Questionnaires that are also quickly and easily set up in the system. They require no programming or technical knowledge to set up and are sent to people to fill in via email or the web, or both. Anyone who has access to a web browser and/or email can be asked by the system for information. PIQ’s are scheduled to go out on a one time basis, or periodically as the particular measure would require. After PIQ’s gather the data (direct links to databases can also be set up), the Broad Reach rules system will give you early warning of issues by raising red, yellow, or green flags based on the answers. By clicking on any heading or flag you can drill down to the supporting data and find out who,why, and for what reasons the flag was generated. 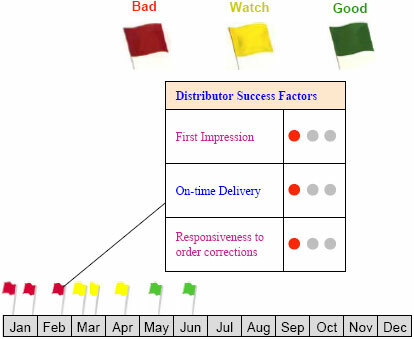 This ability to manage by exception allows managers or customer service reps to be flagged immediately about red (urgent matter with customer) or green (could be request for repurchase) occurrences so they can be followed up on. SystemOnce good or bad flags are generated by Broad Reach, the system will track the resolution of that issue. A manger can delegate activities, and an audit trail is created to show the steps taken to resolve the issue. Problems, Solutions, costs, and savings are recorded in the system as problems are solved so that the Return on Investment of your customer service activities is known. Since the system can measure many previously immeasurable success factors, the ROI savings can truly be a new way of increasing profit and reducing cost. The savings often result simply because that success factor had never been measured before. The way to fix problems seems very simple in many cases, because when the root cause of a problem becomes known, the solution often seems obvious. Savings and ROI can be determined after red flag issues have been clearly identified and eliminated. Broad Reach online tools can be used by your own customer service experts with very little training since the system is extremely easy to use. However, some clients would like help in determining the attributes of customer service, analyzing the value of products or services to customers, and a variety of other ‘survey’ and data analysis of individual and group activities. We can offer any level of support or can offer ‘tune up packages’ based on the services and budget requirements. Consulting packages can get you going very fast and economically while giving your staff the skills to monitor customer service in many creative areas going into the future. 1. Refine the list of customer service attributes you may already have. Perform some research and interviews with key or representative customers to discover and verify the most important service attributes to them. Can do a ‘value analysis’ with a customer or group of customer representatives to determine the value of each function your product or service provides to them. Customer service attribute ranking vs. competitors. Operational analysis of the ability of the organization to deliver stated customer service levels (can set up monitoring of operational success factors). Process analysis of key customer support processes. 2. Setup customer service monitoring with select customers to gain visibility into customer service capabilities on an ongoing basis. 3. Roll out monitoring to individual or groups of customers as measures and attributes are refined. 4. Analyze results to further solidify the relationships between the value provided to your customers for each attribute and the effect on Referrals, Retention, and Repurchasing. 5. Measure the increases in numbers of customers, profitability per customer, and increases in referrals. Achieve proven and documented Return on Investment savings from increased customer service capabilities. Broad Reach’s system allows companies to measure, monitor, and manage previously ‘hard to measure’activities that significantly impact bottom line performance. For a free needs analysis or to request more detailed information on how Broad Reach can significantly improve results in your customer satisfaction and service levels, call us at (847) 441-1851 or submit the contact form below.